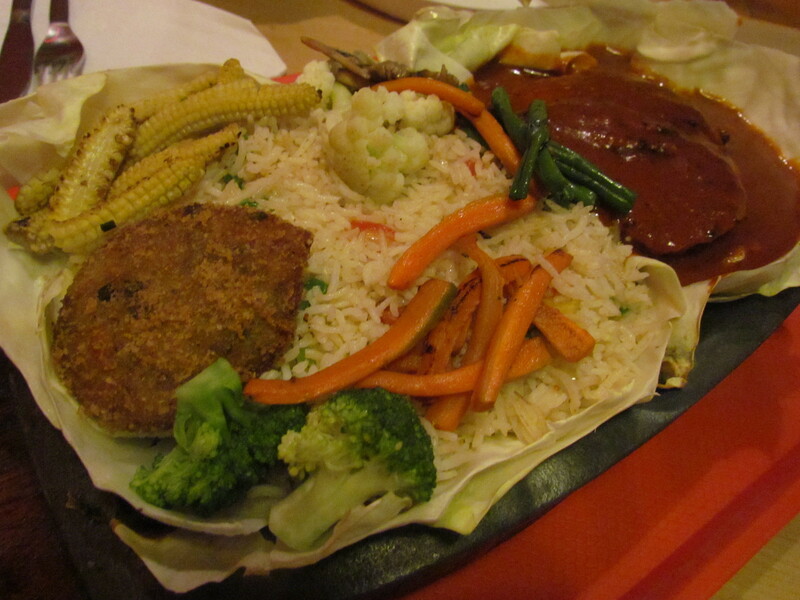 Very Good attempt to serve great food but not upto the mark if u compare with the Tex Mex Restaurants in the US. 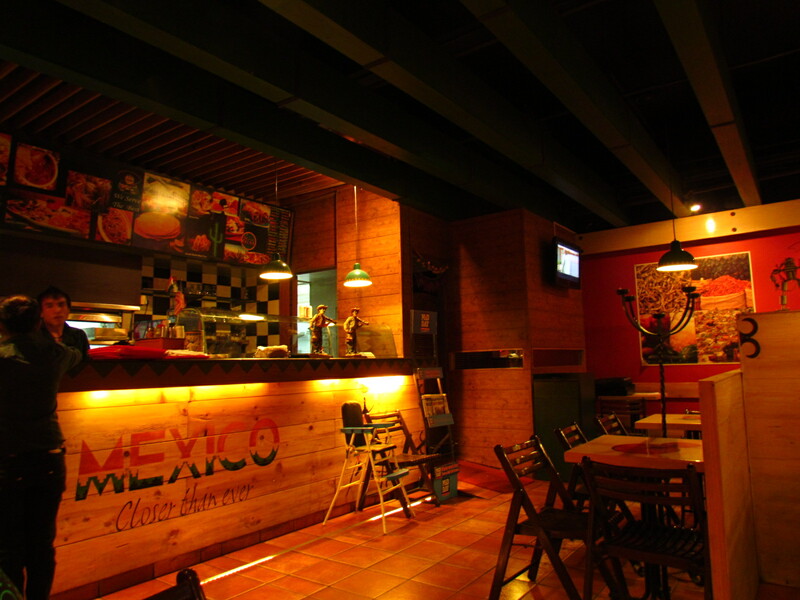 Not bad at all, if u do not compare with the True Blue Tex Mex restaurants in US. 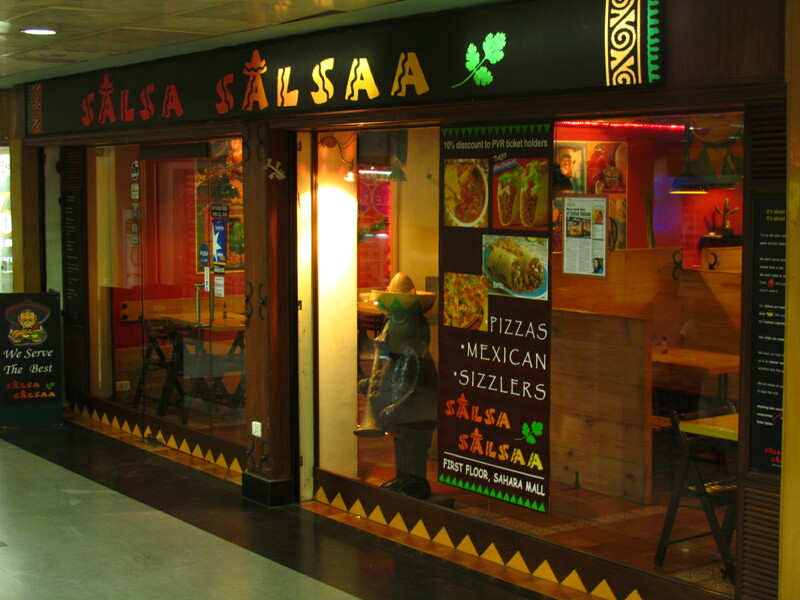 We landed up at Salsa Salsa after recommendation by a foodie friend who suggested that this is one of the best Mexican places in Gurgaon. Post an evening spent here, I must say this is good. However, since I have had the privilege of having the real Mexican food at Tex Mex Restaurants in the USA several times, I can surely say that Salsa Salsa has a real long way to go to match up to that level. It was good compared to some others in Gurgaon but I still prefer Chilis to this. Infact the Mexican section at TGIF is also very good. To read this – click on this. The décor is very colorful – starting from the signboard at the entrance. The interiors are dimly lit overall but each table has its own share of light. The huge partition in the middle of the dining hall is a bit weird coz it makes the place look smaller than it actually is. The people are very courteous & just about knowledgeable about the food they serve. The menu card is full of combo meals & we decided on Combo 4. It turned out to be surely good but not at all great. 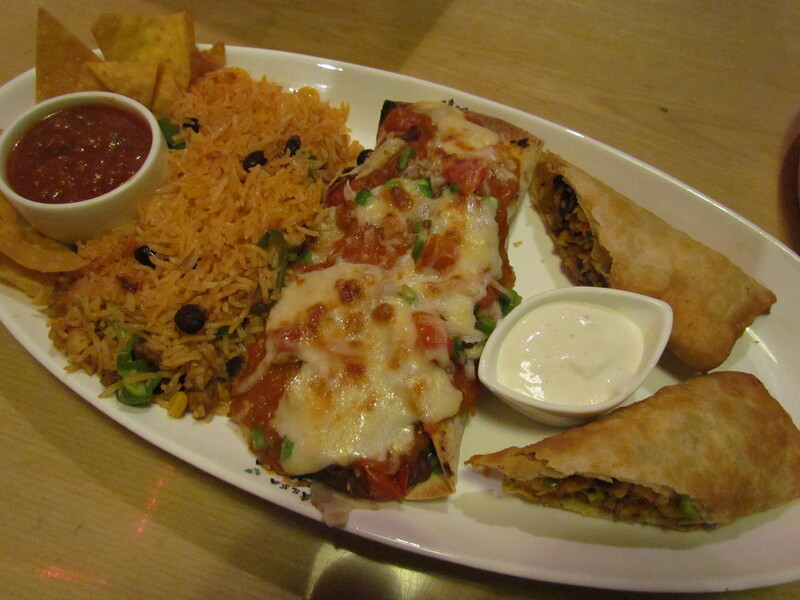 There were 3 things – soft chicken enchilada, chicken chimichanga & chicken Mexican rice. All this served with Nacho chips, salsa, sour cream, salad & coke. 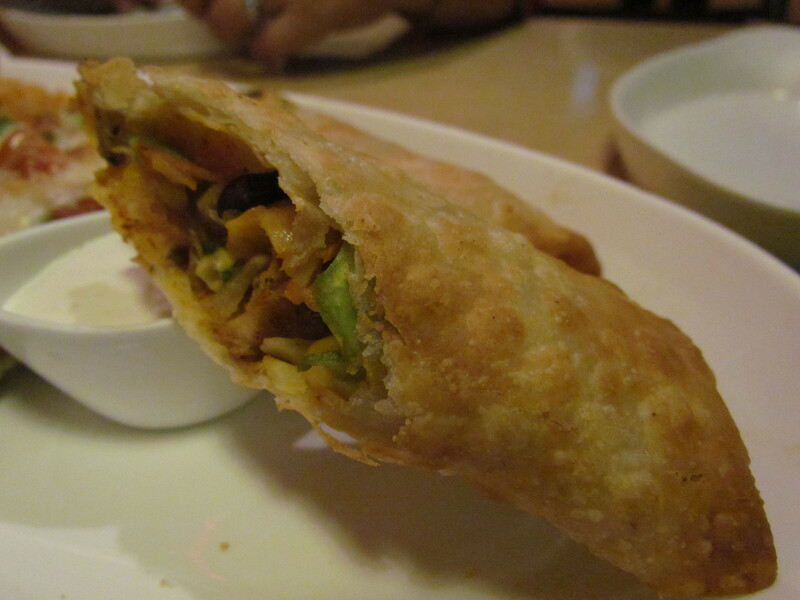 For the uninitiated, Chimichanga is a deep fried burrito with a filling – almost resembling a Chinese Spring Roll. 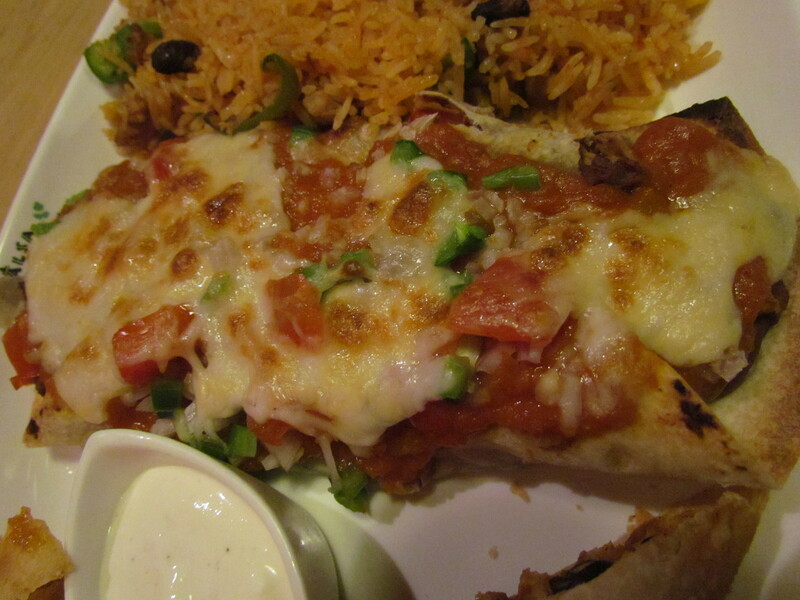 The burrito had layers & layers within, had an outstanding texture – crispy on the outer side & softer as u bite in. The filling was just good – quite short of being outstanding. Overall – I wud say 3/5 for Chimichanga. I wud give this 4/5. 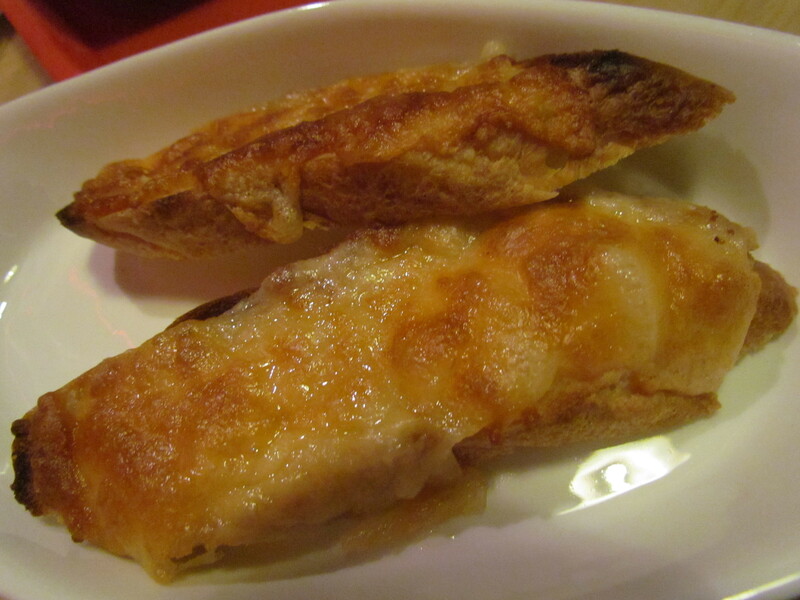 Enchilada is a corn tortilla rolled around a filling & covered with Chilli pepper sauce& loads of cheese. The enchilada served here was very good. It was soft & tasty. Thankfully it did not have an overdose of cheese as served in some places in USA. I wud give this 3.5/5. Rice was the worst of the 3. It was not soft & that is something that pisses me off. 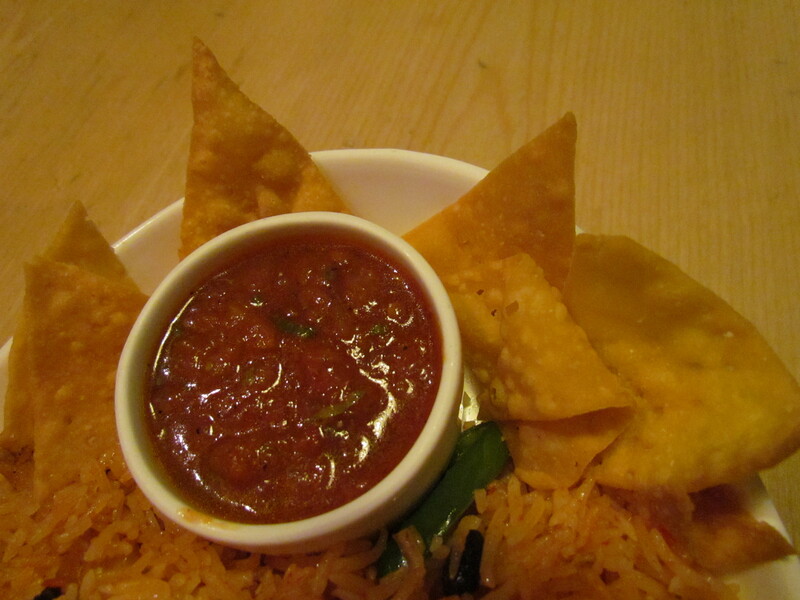 I have had tomatilla rice & several other Mexican rice varieties in the USA & loved them. The rice there is as soft & ‘melt in the mouth’ as in a good lucknowi biryani but sans the dripping fat. 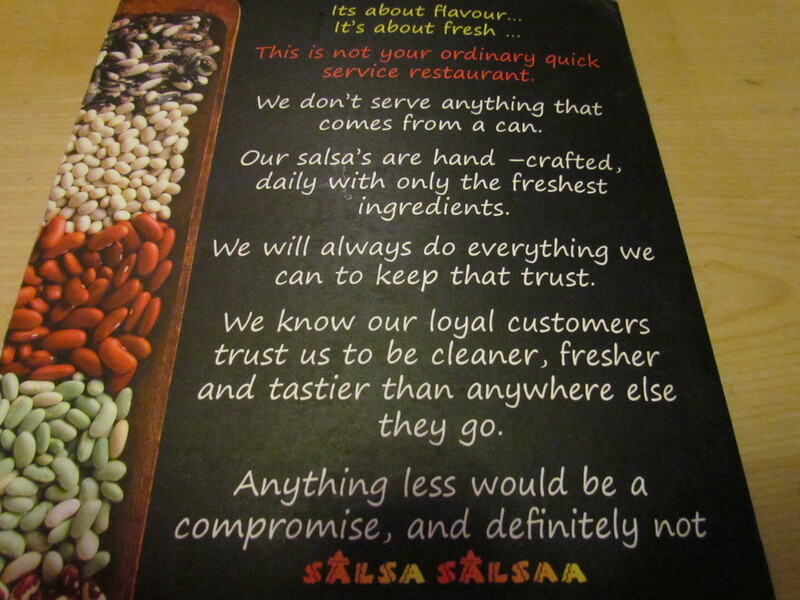 Once I have had that & liked it, this one at Salsa Salsa was a real stretch. I wud give this 2/5. 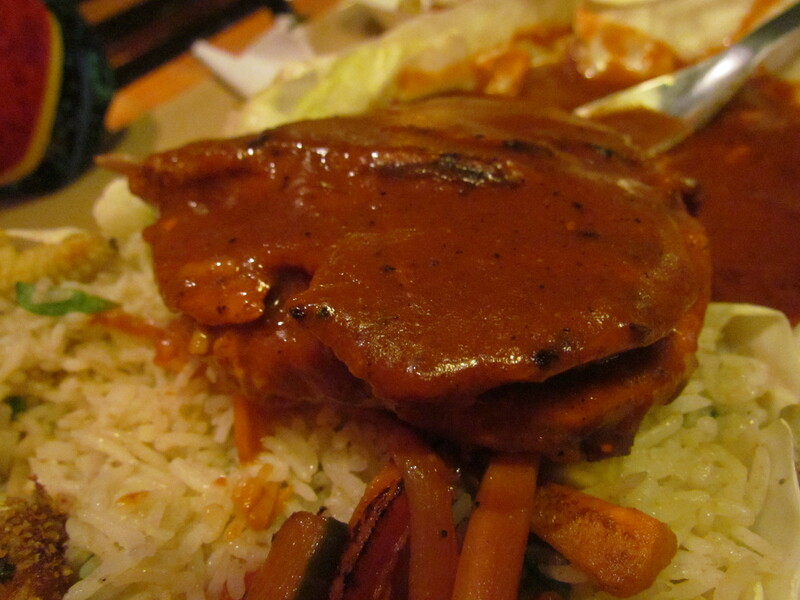 Also most food in the Tex Mex Shops / Mexican Restaurants is made with meat stock – usually beef stock. Since that does not seem to be an option here, maybe we have to accept some downplay in the flavors & the taste. Other stock also makes quite an impact. The salsa served here was outstanding. I wud give this 4.25/5. 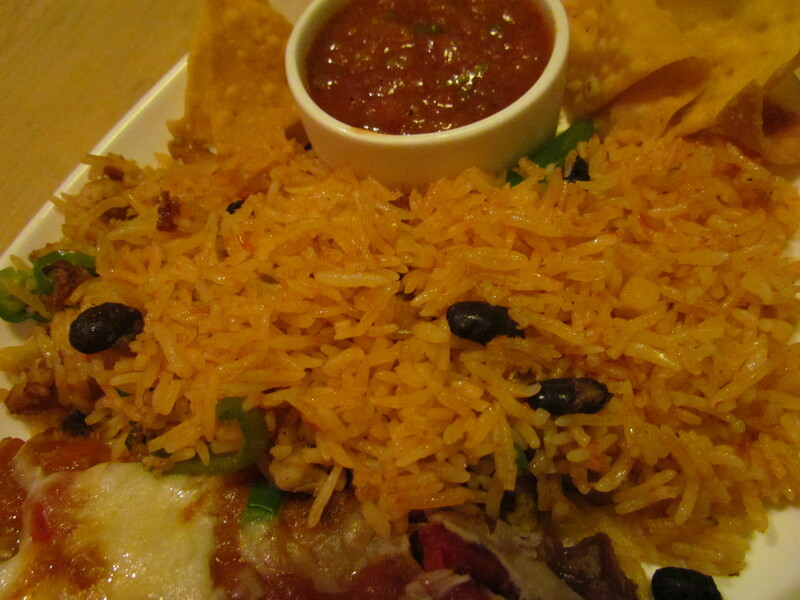 The nachos were also very good as well – made inhouse. I wud say 4/5. Post the combo we asked for the sole mutton grill in the menu. We were told mutton is out of stock. 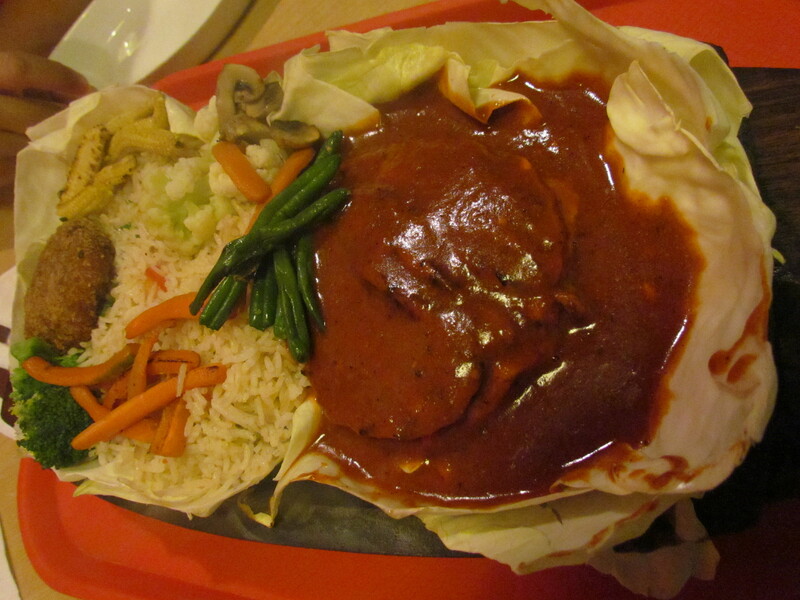 So we chose Chicken Muienuer – It was Grilled Chicken Breast stuffed with spinach &cheese & cooked in Chef’s special red wine sauce. This was served with rice, Garlic Bread, Grilled Onion, vegetable cutlet & sautéed vegetables on a sizzling skillet. The Garlic bread was not bad but at most average. The vegetable cutlet served in Rajdhani express at breakfast tastes better than the one served here. Grilled onions & sautéed vegetables tasted good. 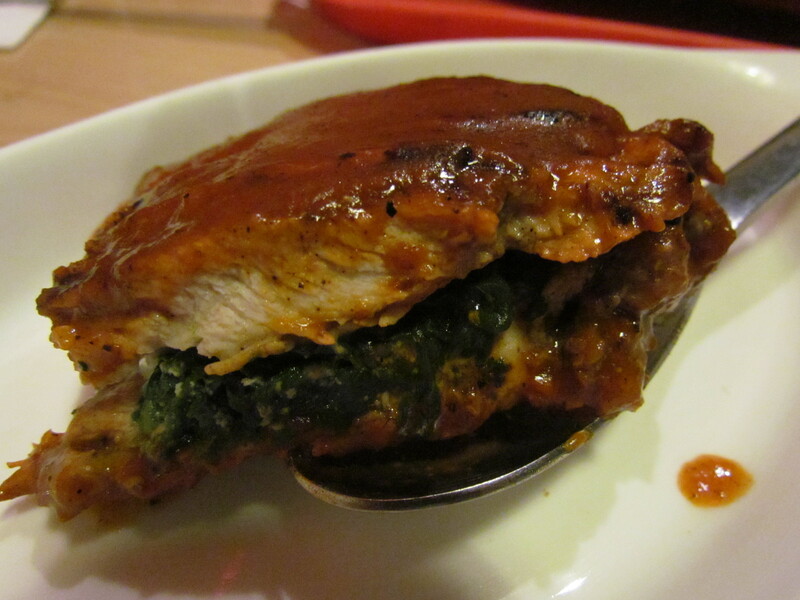 The Chicken breast stuffed with spinach had less salt. That was a problem coz however much salt u sprinkle, it can never be as good as a dish with proper salt. The red wine sauce did not make much of an impact. The spinach was bland – no flavors / taste of spinach was evident. I wud give a 2.5/5 for this dish. Overall, Good place to be, some good dishes, loads of good intent but a long way to go.